Some times when we enter wrong Sim Card Pin Number for more than three times the sim is blocked and it asks for entering the PUK code. 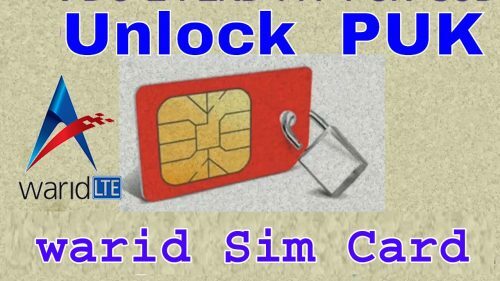 So PUK (Personal Unblocking Code) is necessary to unlock any sim which is blocked. Today I ll tell you how to reset your Warid Sim Puk Code if unfortunately, you have blocked your sim. Warid PUK/PIN codes are printed on the back of every sim card jacket. So first of all try to find your sim card jacket and enter it correctly to unlock your sim. Send an SMS, from any other Warid Number PUK NUMBER <CNIC NUMBER> to 321. 2. Warid Customer Care representative will ask you for required information. 3. On successful verification, Warid Representative will provide you Warid SIM PIN/PUK code. We strongly recommend that there is not even single software or app for resetting your puk or pin code so keep away from these fake software. Even three wrong attempts of PUK/PIN code will result in permanent blocking of your Warid Sim. It was all about checking and resetting your Warid PUK/PIN code checking and resetting. If you have any other information related to this let us know by commenting in the comment section.